Winnipeg’s only bookstore specializing in crime, thriller and mystery books is 21 years old! Jack and Wendy Bumsted, who have owned the store since 2007, say the 20th birthday slipped by them unheralded. Hence the smashing celebration for the 21st. Drop by the store on Sunday, November 9th, starting at 2PM for a reception in honour of this milestone. You can roam around the store, refreshments in hand, and buy a few books. There will be a couple of fascinating talks as part of the formal proceedings. Best part of all, from Nov. 8 to 15, everything in the store is 21% off. You can’t get the kind of service that Whodunit provides at Costco. I read their newsletter from cover to cover as soon as I get it. The reviews and articles by all the Bumsteds–Jack, Wendy, Michael and Sian–have directed me to some terrific books. 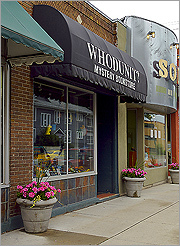 Personal service, the ability to order in any book, even non-mysteries, great support for local authors, a mystery reading book club and a writer’s group–all make Whodunit indispensable to Winnipeg mystery and thriller fans.